The Royal Canadian Mint have published a colorful history of their legendary and most familiar coin in the Canadian monetary system, that of the one cent coin. Introduced in Canada in 1797 as a large copper penny minted in Great Britain, this hard-working Canadian denomination evolved into the version first introduced in 1858 complete with a portrait of Queen Victoria. The Canadian cent was even in place before official Canadian Confederation which occurred in 1867 and, for Canada’s centennial celebrations of that confederation, the cent along with the other five circulating denominations weren’t left out of the celebrations as a special set of reverse designs were specially introduced in 1967. The Canadian cent has also been a faithful cornerstone in their history recording all Canadian monarchs since confederation and was also reduced in size in 1920. So, it was with some regret that the Royal Canadian Mint announced in 2011 that the final cent would be minted in 2012 – after more than 154 years of use. From the 4th February, Canadians will no longer be able to use the copper cent coin in transactions and all cash payments will be rounded to the nearest 5 cent increments. 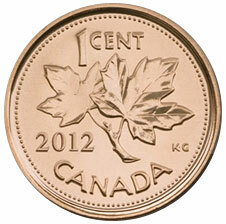 However, they can always be redeemed or exchanged at the Bank of Canada and at their authorized offices. The colorful infographic includes some interesting facts & figures about the cent coin – such as the total weight of all cent coins produced in Canada would equal 103,617 tons or, almost twice the weight as the “Titanic”. The Royal Canadian Mint states that 35 billion cent coins have been minted since 1908… and stacked up one on the other, they would equal 52,600 kilometers in height! The informative graphic can be viewed on the Royal Canadian Mint’s own website at: http://www.mint.ca/store/mint/learn/infographic-history-of-the-penny-7200012#.UQBWWycj7y4 The Royal Canadian Mint are also encouraging the donation of spare cent coins to their favorite charity as they reiterate that the one cent coin can be redeemed any time.